Toad Style's mushroom lentil burger with home made cashew tapioca cheese. BEDFORD-STUYVESANT — Three friends are looking to expand Bed-Stuy’s affordable, on-the-go food options with a new kung fu-themed vegan eatery on Ralph Avenue. Toad Style is set to open at the end of July, featuring items like mushroom lentil burgers, esquites with almond cheese crumbles and cayenne chili spice, and twists on classic sandwiches. Owner Jillian Camera said she and co-owners Tyler Merfeld and Ian Graye were tired of traveling out of the neighborhood for high-quality, accessible restaurants. “We’re not just catering to vegans,” Camera, 25, said. The 14-seat restaurant at 93 Ralph Ave. takes it name from the 1978 martial arts film, “Five Deadly Venoms,” which follows five kung fu fighters with their own animal styles. “Toad style is immensely strong and immune to nearly any weapon. When it's properly used, it's almost invincible,'” Camera said, quoting the movie. “I think of it as our mantra." The trio makes all the dishes from scratch, along with creating their own vegan-version of ketchup, mayonnaise, cheese and butter, she added. Toad Style also pans to be plastic-free for its take-out, delivery and in-house dining by utilizing bamboo utensils and paper products. Sandwiches are expected to range between $7 and $9, and the eatery will serve up two daily soups and a selection of rotating salads. Menu items include fried wonton cashew, vegan ricotta raviolis with red onion and garlic marinara, and a vegan hearts of palm lobster roll with tomato cucumber salad. 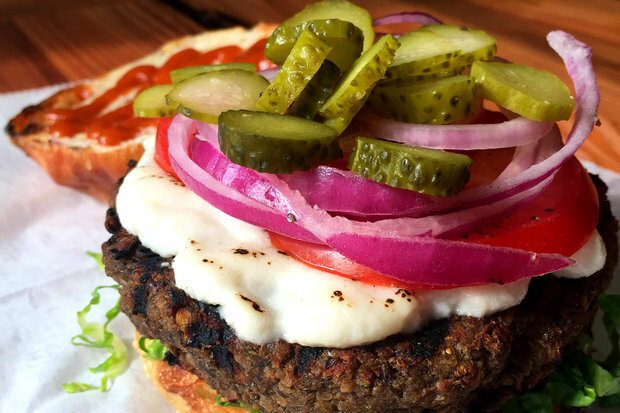 Camera added that the eatery's name "symbolizes what we’re trying to do: a clear focus and objective to be the best and focus on what we think is really important, especially with a lot of the politics revolving around vegan food." The Toad Style space will be decorated with old kung fu posters and also features a backyard, which the owners hope to open in the near future for additional seating.